Argo Navis is a 75 ft custom luxury catamaran launched in 2016. 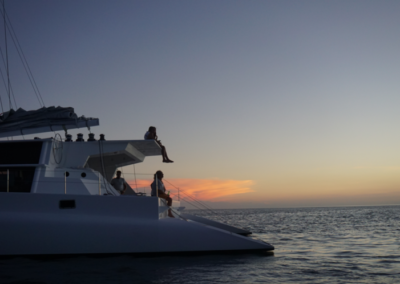 Our charters are all inclusive with the exception of certain luxury items. The vessel carries a complete crew compliment to include: Captain, Chef, Stew/Mate. Argo Navis is a great venue for weddings, corporate events, and large parties. With ample deck space, this yacht can accommodate up to 116 guests. Due to her 36 ft. beam stability is phenomenal making for a very comfortable ride. It is a very versatile boat, whether you want to just relax or go for a spirited sail. Argo Navis draws 3.5 feet which makes it possible for her to creep into the shallowest anchorages in both Cuba, Bahamas and the Florida Keys. With the dagger boards dropped the vessel draws 8 feet and becomes a very able sailor (managing 38 Deg. Apparent at 10kts in 9kts of wind). With a beam of 36 feet you’d be hard pressed to find a more comfortable ride under way, with a consistent cruising speed of 10 to 12 knots which makes even the most demanding cruising itinerary possible. The bridge deck is high off the water which minimizes the wave slapping that occurs on many catamarans. To say the saloon is vast would be an understatement. There are two dining areas to provide seating to twelve people very comfortably. With meals being provided by the fully stocked galley. Ahead of the galley is the entertainment center and Navigation Station.Below the main deck are three King Sized State Rooms all with their own en-suite head and showers. All cabins are climate controlled. 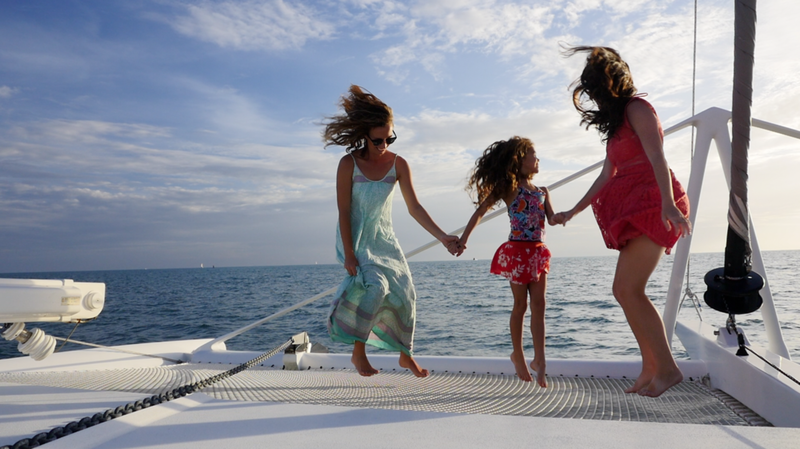 We carry a 15 ft zodiac aboard as a tender for bringing guests ashore, snorkel trips, fishing and, exploring. With a 40 hp Yamaha outboard the tender can be used for wake boarding or skiing. Entertainment center: (56″ Samsung smart TV, Bose surround sound, DVD, Bluetooth, FM AM, Sirius radio). 0ne 25 KW generator and one 5 KW generator.